Happy Diwali! This is our first year celebrating Diwali since Surya has been old enough to understand the holiday. We’ve been reading her Amma, Tell Me About Diwali (which I would recommend) and just lit diva’s together tonight. 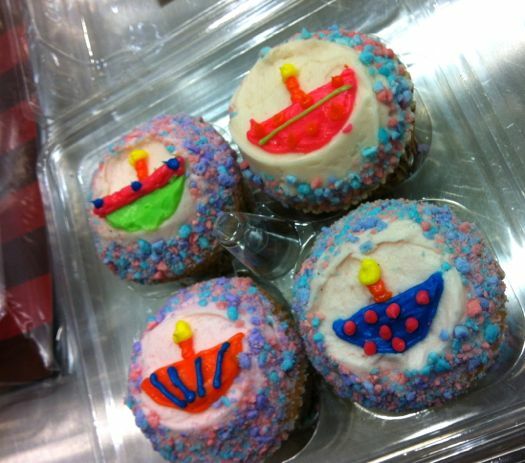 To make it even more special, we’re taking these cupcakes in for her pre-K class tomorrow. No, those aren’t boats as one friend asked. They are divas! In the interest of full and fair disclosure, I didn’t make these. 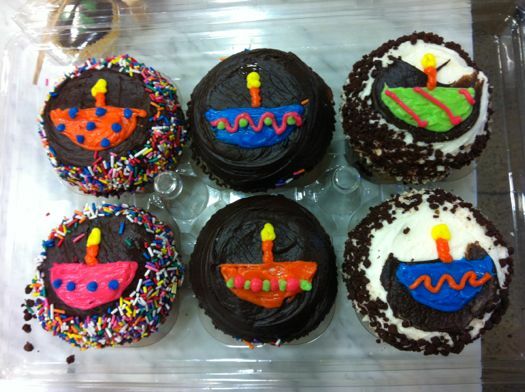 One thing I love about New York is that you can walk into a cupcake shop in the Flatiron District, tell them you want Diwali cupcakes for your daughters class and the non-Indian staff will say something culturally in-tune like “Oh, you want diyas?” So thank you to the lovely staff at Crumbs who decorated these cupcakes with a diya design I sketched out and added all of the extra colors, squiggles and stripes.